The history of science is filled with stories of enthusiastic researchers slowly winning over skeptical colleagues to their point of view. Astrophysicist Scott Hughes can relate to these tales. "For the first 15 or 16 years of my career I was speaking to astronomers, and I always had the impression that they were politely interested in what I had to say, but regarded me as a little bit of a wild-eyed enthusiast who was telling them about a herd of unicorns that my friends and I were raising," said Hughes. "Now," he continued, "there are people who are going, 'Ooh, all those unicorns you found, can I use them to solve my problem? Do your unicorns have wings? Are they sparkly?'" These unicorns are gravitational waves, an area of physics in which Hughes specializes. While working as postdoctoral researchers at UC Santa Barbara's Kavli Institute for Theoretical Physics (KITP), Hughes and his colleague, Daniel Holz, were among the first to propose using the phenomena, in combination with telescope-based observations, to measure the Hubble constant, a fundamental quantity involved in describing the expansion of the universe. As the universe expands, it carries celestial objects away from us. This stretches out the wavelength of light we detect from these objects, causing it to drop in frequency just like a siren on a passing ambulance. The faster the object is receding, the more its light will shift toward the red end of the spectrum. The Hubble constant relates an object's distance from Earth to this redshift, and thus the object's speed as it's carried away. One of an astronomer's best tools for calculating this is a standard candle, any class of objects that always have the same, standard brightness. If scientists know the brightness of an object, they can determine its distance by measuring how dim it appears to us on Earth. 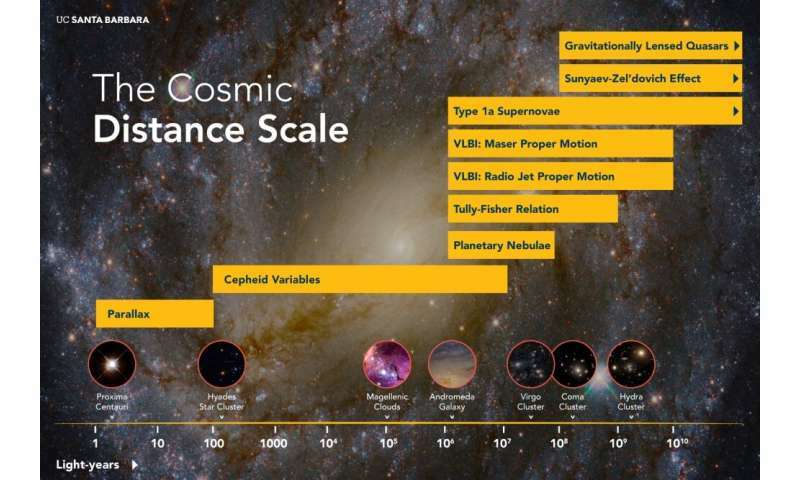 For decades scientists have tried to get accurate measurements of the Hubble constant in order to investigate why the universe is expanding, and, in fact, accelerating. This ultimately resolves to measuring objects' redshifts and matching them with independent measurements of the objects' distances from us. However, these two most accurate measurements scientists currently have for the Hubble constant disagree—an endless source of frustration for cosmologists. This was the cosmological landscape in the early 2000s when Holz and Hughes held positions as postdoctoral researchers at KITP. 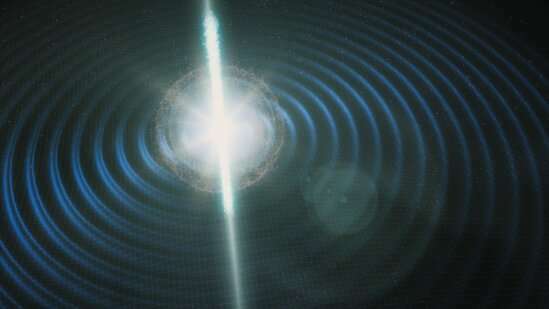 "Scott had been thinking about gravitational waves for a while," said Holz. "He was the expert, and I was much more focused on cosmological questions." But Hughes' enthusiasm soon piqued Holz's curiosity, and the two began to talk about gravitational wave cosmology in the office and on walks along the Santa Barbara bluffs. Holz and Hughes credit their close collaboration to the construction of the new wing of Kohn Hall in 2001. Initially, all postdocs at KITP had their own offices, explained Hughes, but the construction forced them to double-up. "Suddenly we were spending a lot more time with each other." A 2002 KITP program on cosmological data fanned the flames of their interest in the topic. By the time Hughes left to join the faculty at MIT, they had finished the first draft of their paper detailing how to calculate the Hubble constant with gravitational waves. After two years gestating they finally published the study in The Astrophysical Journal. "I had a great time writing that paper with Scott," said Holz. "I learned an incredible amount. So much that I was convinced that gravitational waves were the future, and that I should get involved." The idea of using gravitational wave sources to measure the Hubble constant was not new. The concept was first proposed in a visionary paper back in 1986 by Bernard Schutz. And a number of other notions regarding gravitational waves were also floating around the literature in the early 2000s. But what Holz and Hughes did was synthesize all these ideas and emphasize the feasibility of combining data from gravitational waves with follow-up observations using light. The study also was the first to use the term "standard siren." Hughes recalled discussing the paper with Caltech astrophysicist Sterl Phinney, who remarked, "Hmm. Kind of like a standard candle, but you hear it. You should call it a standard siren." Holz independently had an almost identical conversation with physicist Sean Carroll, a former KITP postdoc himself. Holz and Hughes included the term in their paper, and it stuck. The phrase has since become ubiquitous in cosmology. "The term 'standard siren' might be our most lasting contribution, Scott," Holz remarked. "I'll take it," laughed Hughes. Using gravitational waves to measure the Hubble constant has many advantages over other methods. Certain supernovae provide decent standard candles, "but, as a standard candle, supernovae are not very well understood," said Holz. "The main thing that makes standard sirens interesting is that they're understood from first principles, directly from the theory of general relativity." When using standard candles, scientists have to calibrate the distances of certain classes of objects using the information from other ones, effectively leapfrogging their way to a proper distance measurement. Astronomers call this method a "distance ladder," and errors and uncertainty can creep in at many points in the calculations. In contrast, gravitational waves can provide a direct measurement of an object's distance. "You just write down the equations and solve them, and then you're done," said Holz. "We've tested general relativity for a hundred years; it really works, and it says 'here's how far that source is.' There's no distance ladder, there's none of that fiddling around." All the early papers on measuring the Hubble constant using gravitational waves were somewhat speculative, according to Holz. They were proposals for the far future. "We hadn't even detected gravitational waves yet, much less waves from two neutron stars, much less with an optical counterpart," he said. But interest and enthusiasm for the technique were growing. Hughes remembers colleagues coming up to him after his talks and asking about the likelihood of observing a standard siren in the next decade. He didn't know, but he did say that with a better understanding of the optical counterpart, they could probably localize an event to within 10-20 square degrees. "And I think if you have that, every piece of large glass on Earth is going to stare at that spot on the sky," Hughes had said. "And, in the end, that is exactly what happened." On August 17, 2017, less than two years after detecting the first gravitational waves, the LIGO and Virgo observatories recorded a signal from merging neutron stars. Thanks to an alert system, which Holz helped establish, a flurry of activity followed as nearly every major ground and space-based observatory trained their sights on the event. Scientists collected data on the merger in every region of the electromagnetic spectrum. "It really is one of those things where, if it had happened before I retired, I would have been happy," said Hughes. "But it actually happened before I turned 50." Suddenly, gravitational wave cosmology was a real field, and standard sirens were another part of the toolkit. "But for something to become part of the toolkit so quickly? That's extraordinarily unusual," said Holz. It turns out that cosmologists need another tool, because they currently have two different values for the Hubble constant. Methods using the cosmic microwave background—faint light left over from the big bang—yields a value of around 68. Meanwhile, calculations that use Type Ia supernovae—a variety of standard candle—yield a bit more than 73. Although they appear close, the two values actually differ by three standard deviations, and both have fairly tight error bars. The disagreement has cosmologists increasingly concerned as the error bars on these two values only get tighter. It could signal a fundamental problem in our understanding of the universe, and is the subject of a KITP conference this July. There are a few intrinsic differences between the two techniques, though. The cosmic microwave background reflects the conditions of the early universe, while the supernovae paint a picture of the current universe. "There's a chance that maybe something very strange and unexpected has happened between the early and late days of the universe, and that's why these values don't agree," said Holz. But cosmologists simply don't know for sure. Getting another, independent value for the Hubble constant will help clear up this conundrum. "Because it's so clean and so direct, that measurement will be a very compelling number," Holz explained. "At the very least, it'll inform this discussion, if not just completely resolve it." Holz and his colleagues, Hsin-Yu Chen and Maya Fishbach, have just published a paper in the journal Nature, finding that 20 to 30 observations would allow scientists to calculate the Hubble constant to within 2 percent accuracy, tight enough to begin comparing it to the two values from the cosmic microwave background and supernovae. This summer, Holz is co-organizing a KITP program on the new era of gravitational wave physics and astrophysics, and the new field of standard siren cosmology will be a major topic of discussion. In fact, Holz also helped organize the KITP rapid response program that brought researchers together shortly after LIGO's first detection of gravitational waves. Holz and Hughes credit their success to their experiences at KITP. "While working together at the KITP the two of us got excited about measuring the Hubble constant using gravitational waves," said Holz. "And that's exactly what the KITP is about: bringing different people together with different backgrounds, stirring the pot and seeing what happens." For the past decade Holz's career has focused on standard siren cosmology. "And the amazing thing is we've actually done it," he said. "I helped write the paper that did the first standard siren measurement ever. This was exactly what Scott and I had hypothesized about years before." 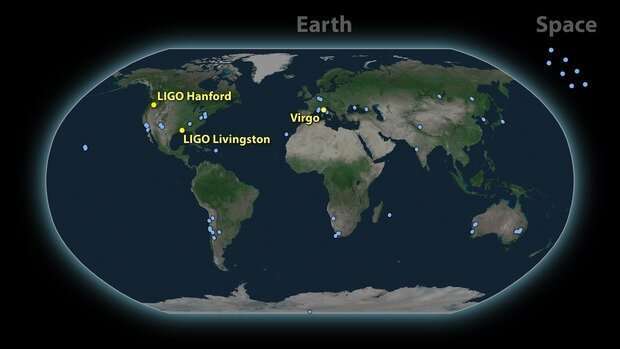 "If both of us hadn't been at the KITP there's no way I'd be spending a good fraction of my life on LIGO teleconferences right now," said Holz. "But I wouldn't have it any other way."